Many meetings in Mackay – Sugar vs the Reef ? 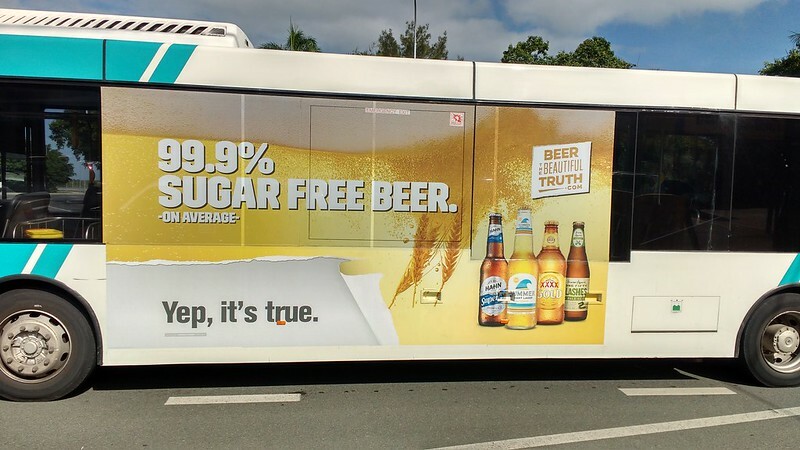 Bus advertising in Mackay – sending strangely mixed messages to the locals. It’s mid-March, and we’re back in Mackay to have meetings with quite a few people and organisations. It’s very hot and humid and locals are saying that although there’s been some rain, the usual wet season of March hasn’t really happened. Simon Mattsson, our main cane-farmer collaborator, is hoping for some rainfall for his crops before the dry season begins. The Mackay region is only mildly in drought, unlike the other 87% of Queensland which is drought-declared. It looks relatively green here from the sprinklings of rain. The main focus of our time here is to advance the Botanic Gardens Land Art Project to the next stage of planning, which means having lots of meetings to share our ideas with lots of locals. As well as specific meetings about the Land Art Project, John Sweet has lined up introductions with folks who connect in one way or another with Sugar vs Reef?. John, a retired farmer who lives in Netherdale up the Pioneer Valley, is a driving force behind our whole project – and as usual he has put together a solid schedule for us. 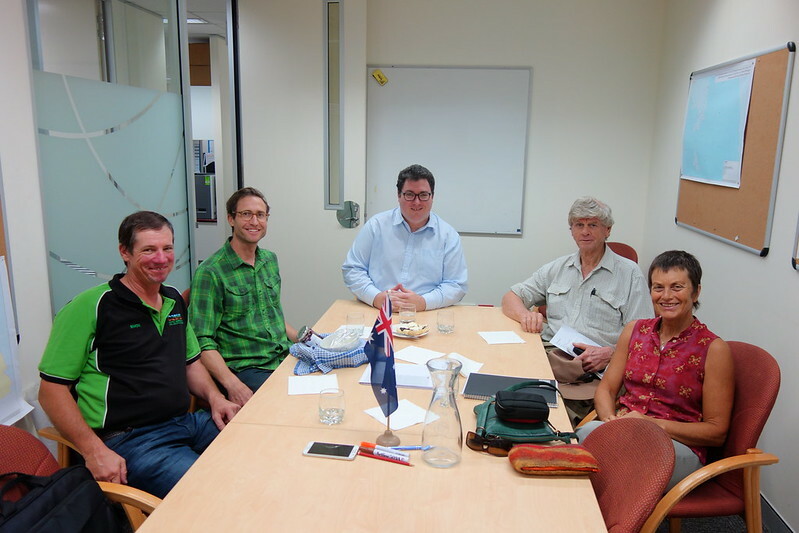 Our first meeting was with the Mayor of Mackay, Greg Williamson. 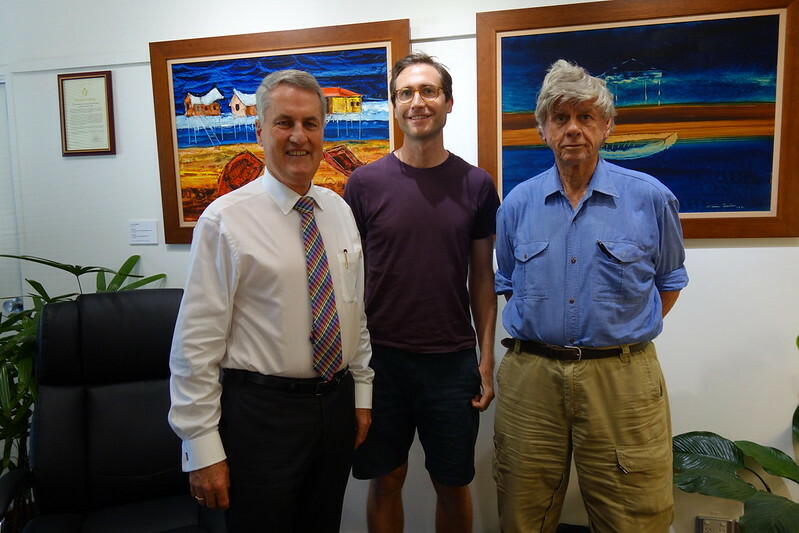 The Mackay Council has been very supportive of our project so far, and we have received community arts funding from the council’s Regional Arts Development Fund (RADF) for our current trip to Mackay. 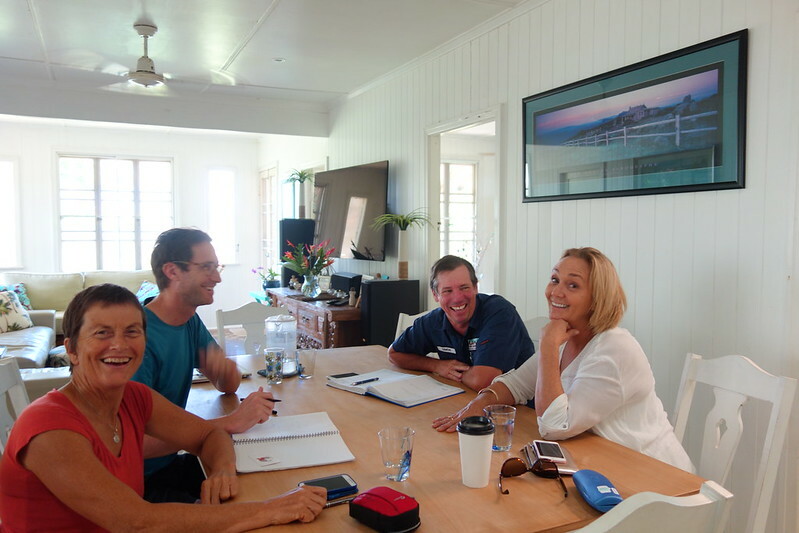 This is the first time we’ve had the chance to meet Greg, so we wanted to let him know about all the positive local initiatives we’ve been connecting with via the Sugar vs the Reef? project. Lucas, John Sweet, Simon Mattsson and Kim with Starrett Vea Vea (in red) and members of MADASSIA. 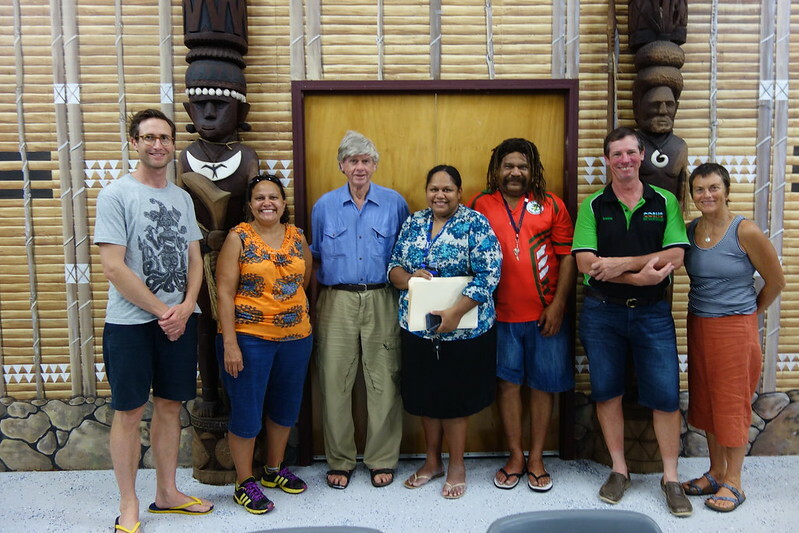 Here we are at a meeting of MADASSIA (Mackay and District South Sea Islander Association) to talk about the Botanic Gardens Land Art Project. 2017 marks the 150th anniversary of the arrival of South Sea Islanders in Mackay, and there are ongoing festivities across the year to celebrate. Given the historical importance of the South Sea Islander community to the sugar cane industry, and given that we’re planning to grow a sculpted crop of sugar cane with sunflowers in the Botanic Gardens, we have invited them to be involved. We all brainstormed possibilities for participation – whether it be in the growing and maintenance and harvesting of the crop, or in organising cultural events, workshops or celebrations surrounding the artwork. One of the issues with working at the Botanic Gardens site is a lack of irrigation. This means that we may need to limit the size of the planting. A potential benefit of a smaller size crop means that it operates at “human scale” – planting, weeding and harvesting can all be carried out by hand. This means that humans can be involved (rather than just big machines) – which allows for more community participation. For the members of MADASSIA, this might mean having a go at the cane planting and cutting just like their grandparents or great grandparents back in the day. What do you do before having a meeting with a famous Member of Parliament? You have “smoko” of course! 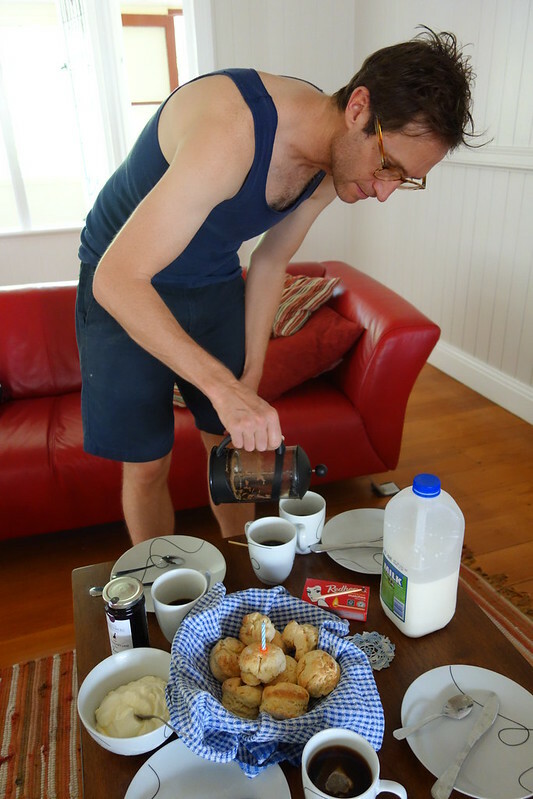 So, to prepare for our mid-morning meeting with George Christensen, MP (Federal member for Dawson), Lucas baked scones. Simon Mattsson, Lucas, George Christensen, John Sweet and Kim. Photo taken by George’s dad. We talked about many things with George. He’s met Simon before, when the idea of growing medicinal marijuana was mooted and supported by George. (In this article, Simon and fellow canefarmer Joe Muscat give their thoughts on the matter). George asked Simon about the viability of large-scale chickpea cropping in the Pioneer Valley, as there is a market in India for this food crop – in fact, Mr Adani Himself is interested in sourcing vast quantities of chickpeas for the subcontinent. Simon’s opinion is that chickpeas can’t be consistently and reliably grown in the Mackay region. (Soybeans on the other hand have proven successful). 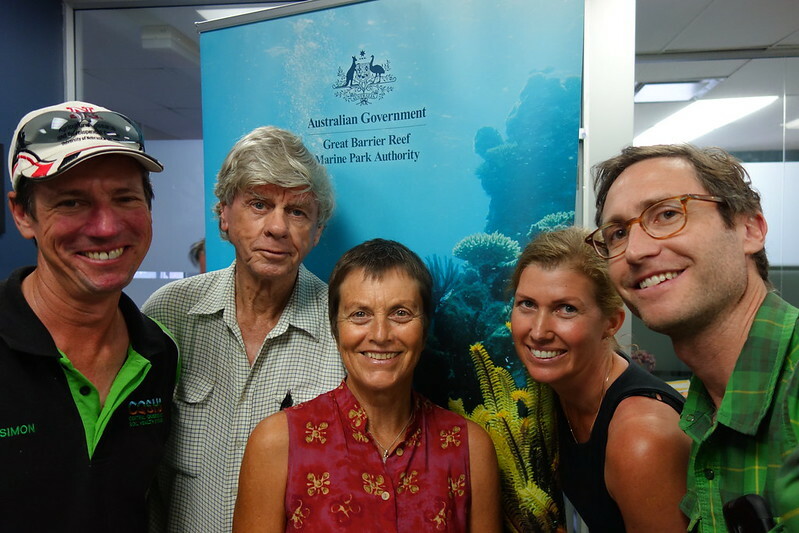 Next stop was a quick visit to Kate at the Great Barrier Reef Marine Park Authority (GBRMPA). We’ve had excellent support from GBRMPA and the Mackay Local Marine Advisory Committee (LMAC) ever since we started working on Sugar vs the Reef?. Kate and her colleague Carolyn are very excited about the work we’re doing. 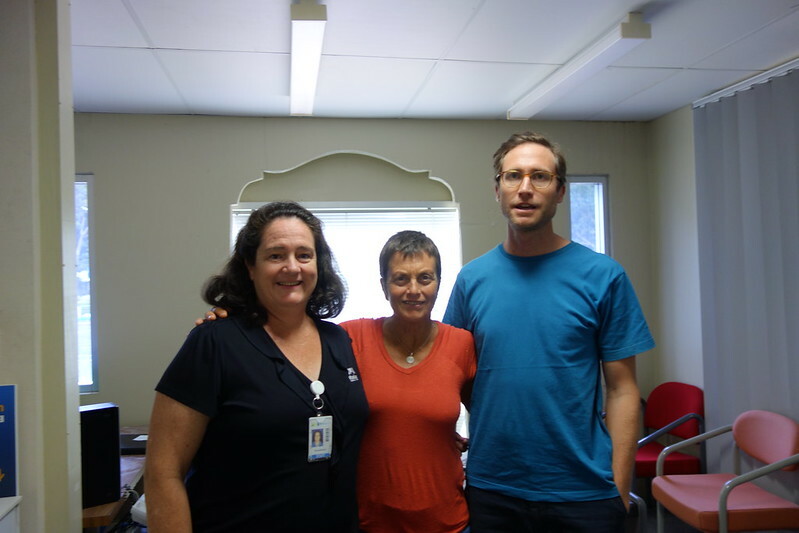 We talked about connecting with local Reef Guardian Schools, and began discussing the possibility of a school visit to Simon’s farm in August. By now we were feeling like garden gnomes on tour, making sure we shot selfies in various offices across Mackay. 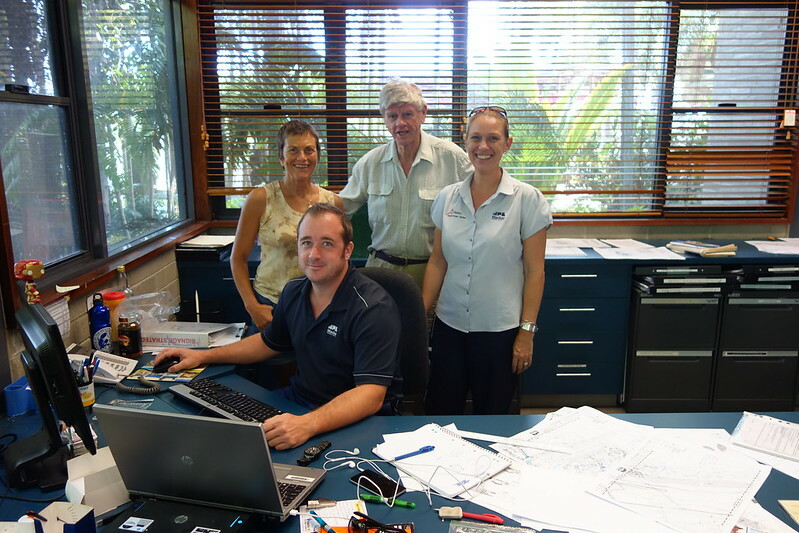 Following our pitstop at GBRMPA, we headed to the Mackay Regional Botanic Gardens to meet with Richard Brown (co-ordinator) and Simone Mellor (business support). 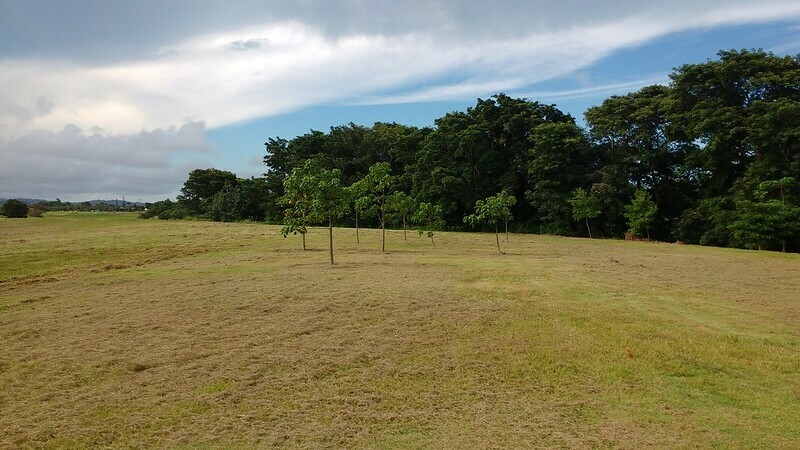 Richard is very supportive of the idea for our Botanic Gardens Land Art Project, saying that there is also support up the chain of command, and that what we’re doing is a great fit with many of their objectives. We discussed our current plans and some of the logistical considerations for cultivating the sugar cane/sunflower crop. Plenty more work to do on this before any sods get turned! Afterwards we took the opportunity to walk over the proposed site and have a think about the sculptural possibilities for the crop, as well as consider the practicalities. Access to water for irrigation will be tricky, so we are currently intending to grow a smaller crop and to hand weed and harvest the crop. This opens up many possibilities for participation and enactment of pre-industrial sugar cane farming methods. Wednesday morning: a bright and early meeting with Kim Kleidon at Simon’s farm in Marian. Kim’s a well-known figure in the Mackay region, having previously been a local ABC radio presenter for many years. Kim is now running her own business as a communications consultant, project manager, cinema director … you name it she does it! She’s a dynamo – her energy, acumen and extensive local connections will no doubt be a boon for many aspects of our project. We talked about the Sunset Symphony in the Sunflowers event on Simon’s farm planned for late July, our Land Art project at the Botanic Gardens, and the ongoing deeper questions about encouraging positive developments for the sugar cane industry. 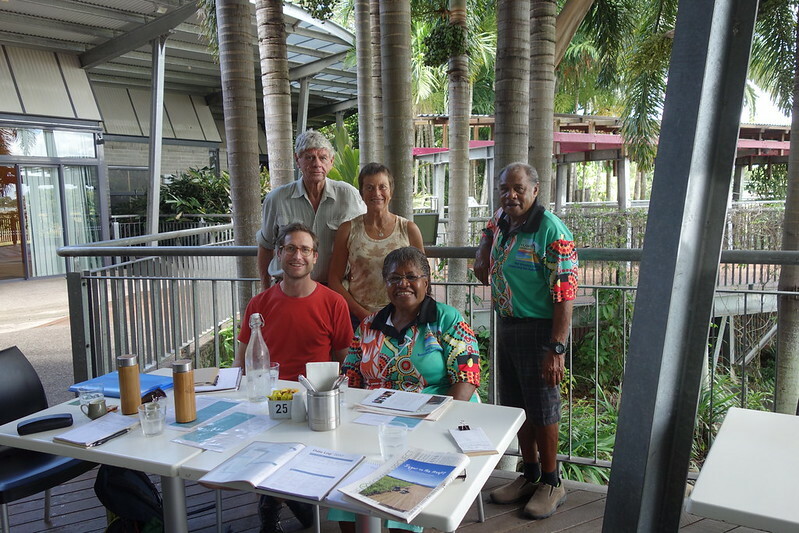 From there it was a short trip to Mirani, where we met with the wonderful Fiona Vuibeqa, one of the Regional Arts Development officers in Mackay Council. 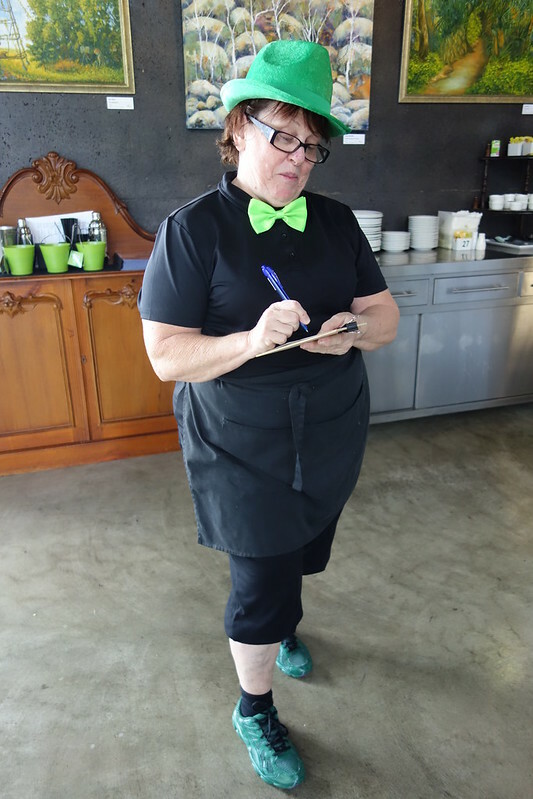 Fiona is a fantastic connection to have, not only for her enthusiasm for our work, but also for her close links with the art community of Mackay and her connection to the Pacific Islands (she is married to a Fijian man). She gave us many leads and wouldn’t let us leave without a big hug. We then treated ourselves to a walk and a cooling swim at Finch Hatton Gorge, a favourite haunt. We were there with John Sweet to meet with George and Robyn Tonga. George is an Aboriginal elder from the Yuwibara Aboriginal Corporation. He is part of both the South Sea Islander and Aboriginal communities. Robyn’s heritage is from both Solomon Islands and Vanuatu. The Yuwibara Corporation has a land claim which stretches from O’Connell River in the north, out over the Eton Range to the west, south to Cape Palmerston and 10km out to sea in the east. We had a long and relaxed yarn with George and Robyn. George grew up around Bakers Creek, where the first settlers established themselves. As a young boy he learnt to cut cane by hand, as it was done in those days. We were very excited to hear this, as we’ve been searching for someone who could teach others this technique. At that time, cutters were paid “2 bob per ton”. We’re looking forward to coming back to Mackay in mid-July to continue our community consultations and do some more logistical planning.